New Hampshire Gov. Chris Sununu said he "strongly recommends" towns still hold elections Tuesday, despite an impending snowstorm. Local elections for most towns were scheduled for Tuesday, the same day the storm is expected. 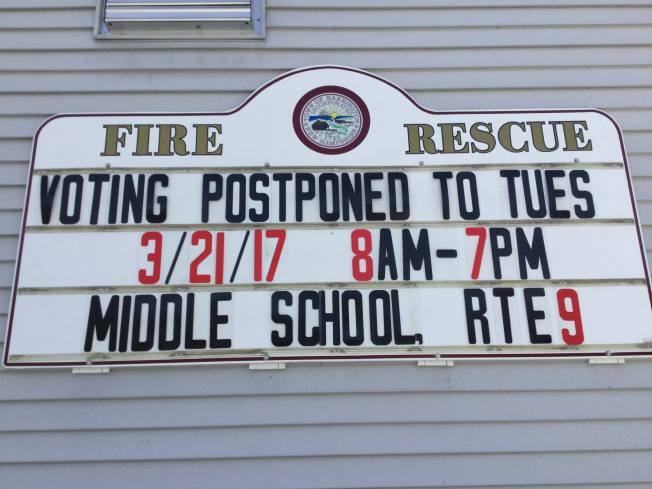 Some towns rescheduled elections because of the forecast. But state laws say the elections have to take place regardless of the weather. Some towns, such as Candia, which moved its elections to Thursday, pointed to another state law that says in the event of a "weather emergency" on or before a voting day or a deliberative session, the town moderator can reschedule up to two hours beforehand. Sununu said the state won't mandate towns to hold elections because there is differing opinion on the laws related to local elections. He and Attorney General Joe Foster had a conference call with town officials Monday to discuss options. He said towns are postponing elections "at their risk," suggesting they could be open to lawsuits for voter suppression. His office is recommending towns that choose to move their elections make sure someone is available to provide absentee ballots during the scheduled voting time. Sununu did not have an exact number of how many towns have moved their elections. Democratic Leaders said they will submit emergency legislation in an effort to reduce the confusion. "As elected officials, we have a solemn duty to ensure the safety of our citizens and no election should require voters to risk their safety in order to participate," Senate Democratic Leader Jeff Woodburn and House Democratic Leader Steven Shurtleff said in a joint statement. "Our election workers and town moderators are well-trained and take the task of facilitating transparent and fair elections seriously. We should trust them to make the best decision for their communities and for the safety of their people." The legislation will be introduced Wednesday and will seek to ensure that results from any elections postponed due to the storm are enforceable.